"SH" redirects here. For the Smash 4 player, see Smasher:SH. Sheik's short hop (right) compared to her normal jump (left). An example of where short hops are useful. Link dodges Meta Knight's forward smash by short hopping over him, then using a down aerial to punish. A short hop, officially a short jump (ショートジャンプ, short jump), small jump (小ジャンプ, small jump), or low jump in Super Smash Bros. 4, is the act of inputting a jump command and letting go of the appropriate button or control stick during a character's jump squat. This will result in a jump height that is lower than that of a normal jump. This technique can be performed in all Super Smash Bros. games. A short hop can be performed using any controller and configured control scheme, including button-jump and control-stick-jump methods. A character's jump timing or jumpsquat affects the timing of the short hop, with longer jumpsquats leading to more lenient timing for short hopping. In Super Smash Bros. Melee, for instance, a player using Fox must release the jump input within 3 frames of animation to achieve a short hop, while a player using Bowser must release within 8 frames. For frame data, refer to Jumping. The height of a short hop varies from character to character, but the height is not directly proportional to the height of a character's full jump. In Super Smash Bros., characters have a different full jump height depending on the input type; a jump using the C buttons has a different height from a jump using the control stick. A short hop in SSB refers to an input from lightly tapping the C button to jump, but it is also possible to cause low or medium jump heights using the control stick by not tilting it to 100% threshold. In Brawl's Subspace Emissary mode, the time frame to input a short hop is reduced by 2 frames, increasing the difficulty of performing a short hop. In Super Smash Bros. Ultimate, the standardized 3-frame jumpsquat makes it more difficult to perform short hops with any character. 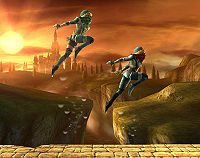 To compensate, players now have the ability to input both a jump and attack button at the same time to perform a short hop aerial (officially known as a "short hop attack" in English and 小ジャンプ攻撃 small jump attack in Japanese). Short hop aerials have a 0.85× damage modifier applied to them, which, in turn, also makes them deal slightly less knockback. Additionally, update 2.0.0 notably added the ability to perform a regular short hop without attacking by pressing two jump buttons simultaneously, further compensating for the 3-frame jumpsquat. The short hop technique is an essential move in competitive play, allowing the user to perform aerial attacks close to the ground and connect with grounded opponents. This can allow for a wider variety of options from a grounded neutral position. In Super Smash Bros., short hops can be used in conjunction with Z-cancels and double jump cancels to cause perfect shield pressure, shield breaks, or grab confirms. In Melee, short hops are used as part of the SHFFL technique to aid in aerial approaches and pressure. 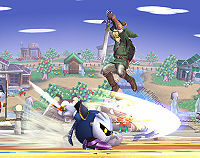 Melee also features the ability to combine short hops with double jump cancels, but it is not nearly as powerful as it is in Super Smash Bros. Short hopping is also used during wavedashing. In Brawl, Super Smash Bros. 4 and Super Smash Bros. Ultimate, short hops can be combined with a reverse aerial rush for characters to approach with back aerials close to the ground. Short hops can also be combined with b-reverses and wavebounces for tricky and unusual momentum changes. Outside of its applications in competitive play, short hopping can also be used for Bat dropping in the Home-Run Contest. This page was last edited on March 20, 2019, at 18:02.